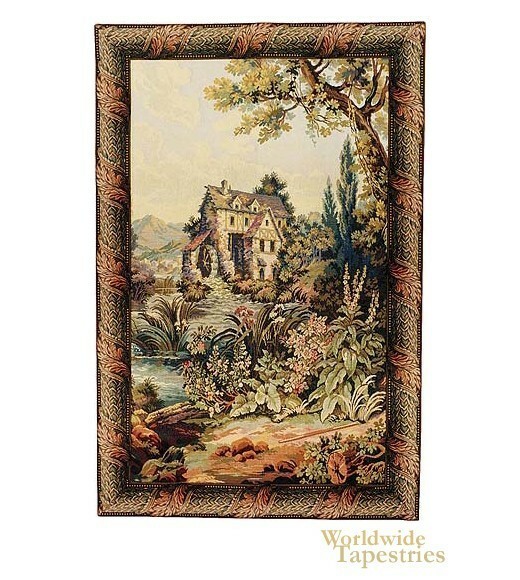 The Old Mill (Vertical) tapestry shows a countryside scene of Francois Boucher. It is part of the Noble Pastorale series of tapestries, designed by the French artist of the Rococco movement. Here we see Boucher's love of life in the countryside where we see a mill in the background. The details of the foliage and trees are superb as they provide the natural beauty in this scene, which verdures are all about. The olive greens and deep greens of the piece compliment the earth tones and beiges of the scene beautifully. The Old Mill (Vertical) tapestry is backed with lining and tunnel for easy hanging. Dimensions: W 45" x H 65"